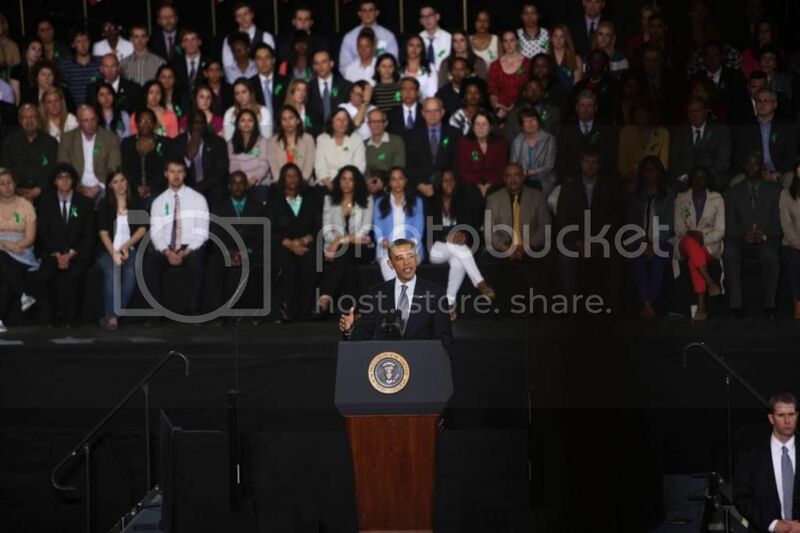 President Obama addresses University of Hartford on April 8, 2013. No, We Won't Back Down. Let's cut to the chase. I'm pissed off. By now you know of the excruciatingly disappointing vote to block reasonable federal gun legislation from passing. One thing is undeniably clear: our quest for commonsense gun laws is far from over. Just as the vote ended, Patricia Maisch, a hero of the Tucson shooting in 2011 that left six dead and another 13 wounded, including former Rep. Gabrielle Giffords, shouted "Shame on you!" - a strong sentiment that deeply resonates with all of us. This is a fight from which we refuse to back down. We will continue to make our voices heard. We are determined to stay the course and carry on the dialogue surrounding gun violence. We're in this for the long haul. No one said it would be easy. But we will never forget the loss of those 20 first graders and six educators who died in the most unimaginable way possible at Sandy Hook Elementary on December 14, 2012. Those could have been my children. For my neighbors, it WAS their children. We refuse to stand by while our government does nothing. We will not stop fighting for background checks. We will not rest until it is both legally and socially unacceptable in every community in our nation for a civilian to carry such deadly weaponry. I'm in this for the long haul. Please join me, my family and my neighbors in our journey upward to more peaceful communities and a nation at rest. We realize that while this is an uphill battle, it is certainly not impossible. We are a part of the shift in the paradigm of what is and isn't acceptable in our society with respect to gun safety. Change will come from all angles - change will come in the form of appeals and lawsuits, from legislation state by state, and most importantly, from the roots up, it will come from you. The ENOUGH Campaign is working diligently behind the scenes to gather valuable information from key players in the gun violence debate, both locally and nationally. We plan to share this info, and subsequent actions that need to be taken, with ENOUGH members (please make sure you have signed up to receive our emails here) as well as the public at large. We are hoping that, through these meetings, we will have more insight and clarity on what our next steps are in curbing gun violence in our communities. We will learn what our roles will be and what tasks need to be accomplished. We will share with you all the details about to whom we've spoken and what the outcomes are as they emerge in the form of essays, Q&A interviews and more. Stay tuned for more info and direction! Sign this petition, which is directed at Steve Sanetti and the National Shooting Sports Foundation, located in Newtown, CT. 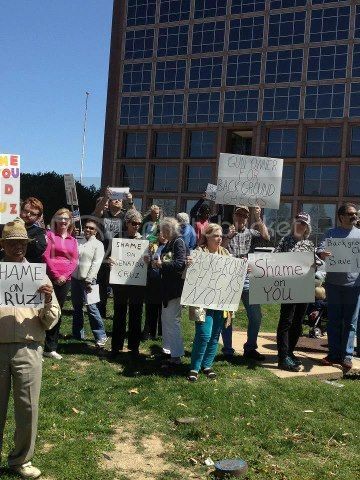 The photos below are of the "Shame on You" protests from this past weekend in Dallas, Texas (Cruz) and Tampa, Florida (Rubio). Photos from CAGV Facebook page. 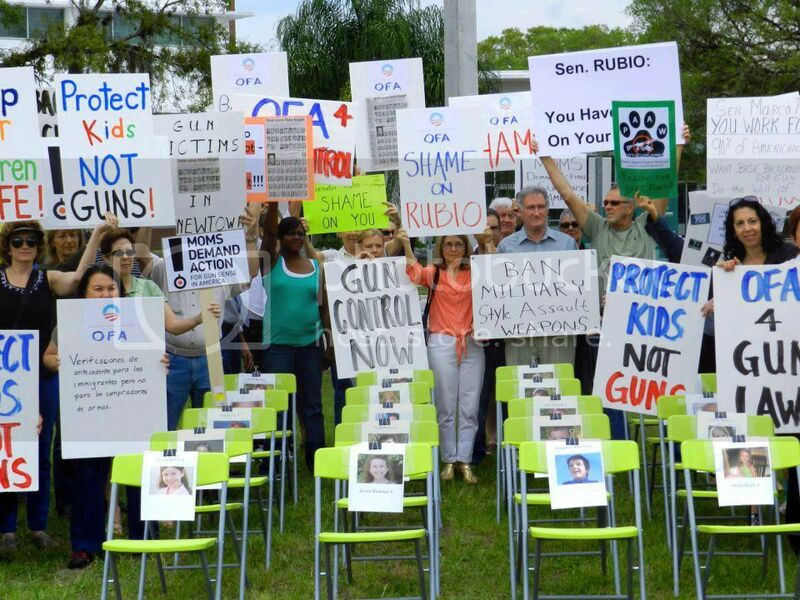 Protesters in Florida make a strong statement by leaving 26 chairs vacant, reserved for the memories of the children and educators killed in Newtown, CT.
SHAME ON YOU protest, Dallas - note gun owner for background checks. 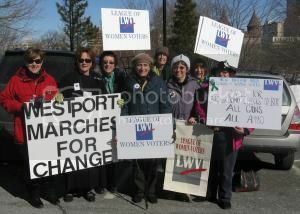 The ENOUGH Campaign members are working closely with the League of Women Voters Stamford to create a panel of experts in the gun debate. The League of Women Voters Stamford presents an Educational Forum on Gun Violence Prevention on Wednesday, May 22, 2013, at 7:00 PM at the Harry Bennett Library on 115 Vine Road in Stamford. During this panel forum and follow-up Q&A, we will address the new gun laws as it pertains to the Stamford community. * What is the state of gun violence in Stamford? * How does the new gun legislation help our city? * What issues were not addressed and still need advocacy? 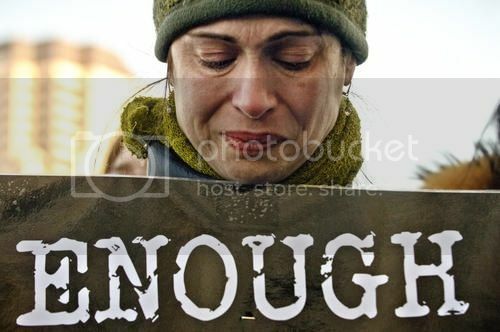 * What can I do to help reduce gun violence? "The time has come to reinstate and use the power of democracy. Shame On Congress will achieve this through a coordinated effort by the previously silent majority to amass an army of voters that will dwarf and defeat NRA-backed campaigns." Stay tuned for more about the Newtown Action Alliance's initiative in the coming weeks. Some insight from Mother Jones as to why the NRA "won". For now. "I am asking every reasonable American to help me tell the truth about the cowardice these senators demonstrated. I am asking for mothers to stop these lawmakers at the grocery store and tell them: You've lost my vote. I am asking activists to unsubscribe from these senators' e-mail lists and to stop giving them money. I'm asking citizens to go to their offices and say: You've disappointed me, and there will be consequences."